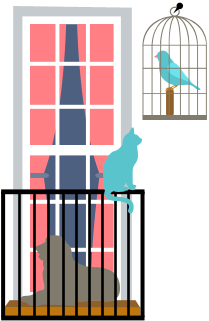 Hello and a friendly welcome to Care For All, a care, house and pet sitting company based near Taunton, Somerset. Aggie Pinney is a fully insured, qualified NVQ level 3 and CRB checked care worker covering the Somerset, the West Country and rest of the UK. 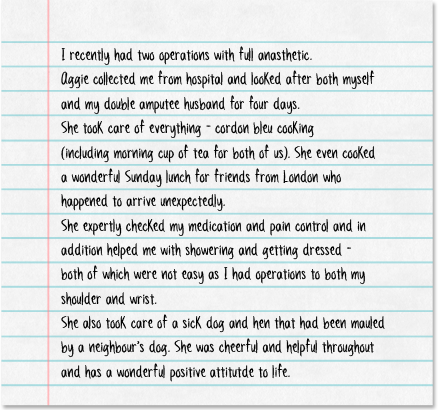 Aggie has several years of experience as a carer and palliative carer, working with families from varying backgrounds. Providing flexibility and valuable respite whilst you are away, or experienced live-in support alongside you in the home, Care For All can ensure your family, animals and property are safe and professionally looked after. Aggie has worked as a qualified NVQ level 3 care worker in the West Country for several years. She has seen first hand that elderly people prefer the familiar surroundings of their own home and frequently it is a companion that is needed rather than a care company that only supply the basics. Aggie has dedicated her time to caring for a number of clients and prides herself on getting to know them individually. By building friendly and close relationships, she allows you to get that essential break knowing your family is safe and happy in their own home. 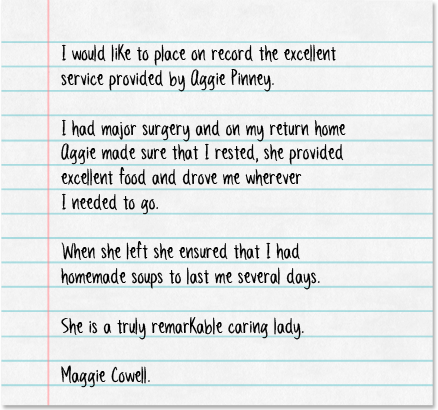 Aggie is patient, easy to talk to and benefits from being a qualified NVQ level 3 carer. Not only can she offer company for your relatives, she is able to help professionally with personal hygiene and oversee dietary and nutritional needs. She is also able to provide transportation, be it to or from a train station, an appointment or just a trip to the local shop. A comprehensive meeting with Aggie will be essential before booking in order for her to meet your relative and assess their needs. Please contact her for details. If you live in a sleepy village in Somerset or a busy town house in London, going away and leaving the house can be stressful. Care For All can give you peace of mind to get away and feel like everything has been taken care of. Having someone house sit and carry out the daily chores puts your mind at ease. 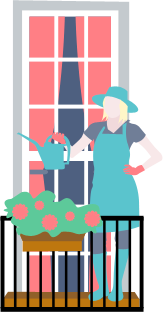 From the simple things like watering plants, collecting mail and being there for security, to more extensive jobs such as cleaning, gardening and shopping in preparation for your return. Aggie has experience in running small town houses in London to large country hotels in the West Country and she understands what is needed to keep a home running. 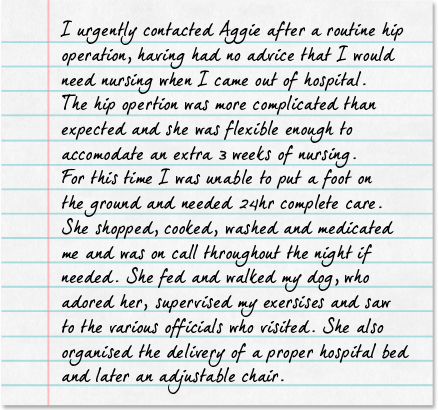 Whatever is needed, Aggie's high standards are sure to exceed expectations. If you have any particular requirements you wish to discuss, please contact her directly. Care For All gives you total flexibility whilst you are away by taking care of your animals. Virtually all domestic animals are considered, including small-holding farm animals, and with Aggie's many years of experience, including being a farmer's wife for 15 years, you can have complete confidence that everything is in hand. Aggie takes great pleasure in working with a range of animals and has been an owner of horses and an owner and trainer of dogs for over 20 years. She is used to the diversity of responsibilities that goes with caring for animals and understands that each has their own individual needs. Please contact Aggie, if you would like to discuss particular requirements or anything else related to Animal Care. It is important to feel at ease and have the recommendation of others when finding a suitable carer. 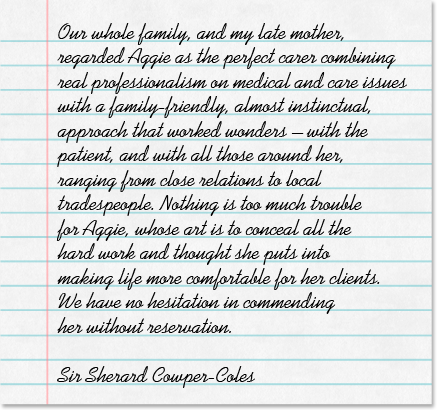 Below are some letters and comments that have been sent to Aggie from her clients that exemplify her good work. Costs are divided into simple levels of care and a chargeable assessment is necessary before booking. If your circumstances do not fit into one of our price brackets, please contact us for a quotation. Please contact Care For All to discuss your requirements. If you have any questions or specific queries, Aggie will be happy to talk them over.